A fiery dimension of lava and ash, the burning Caverns of Cynder are home to many dark and ancient evils, imprisoned within! Rivers of molten rock flow and pool into lakes of fire, forging fiendish Lava Men to assault to fill the vaults of Cyndar, and the pockets of any traveler bold enough to seek them out! 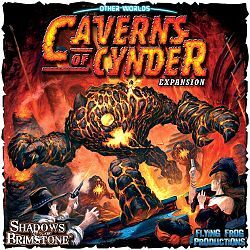 The Caverns of Cynder Expansion introduces a brand new OtherWorld for the Heroes to explore! This includes a full set of 18 new Map Tiles depicting the fiery Caverns of Cynder, with dangerous new Lava Spaces that can burn the Heroes, and Crust that can fall away under your feet! These Map Tiles also have an all new set of unique Mine rooms on the reverse, bringing more variety and new Encounters to discover throughout the Mines. All of the cards needed for this searing lava world are included, such as Cynder Encounters, Artifacts, Map Cards, OtherWorld Threats, and more, as well as a host of new cards for adventuring in the Mines! 6 New Missions will challenge your Heroes, as they hunker down to Defend the Bridge against hordes of attacking creatures, or race to seal Cracks in Reality that have opened up, threatening to tear the world apart! But beware, this new world is overrun with a deadly new Enemy - Lava Men, emerging from the fiery depths to destroy all that would set foot into... the Caverns of Cynder!